Learning to sit is part of your pup's basic obedience training and provides the basis for many other commands. The "sit" command allows you to control your dog when he meets new people or other pets and helps you to keep him calm in a variety of situations. With positive reinforcement and regular training sessions, your pooch should be sitting on command in no time. A clicker is a great way to convey to your dog exactly what you want him to do. Start his training by clicking and then treating your dog. Do this several times in a row. Eventually, when your dog hears the click, he'll associate it with good things, namely a treat. Once this happens, you can "mark" the behaviors that you want from him with a click. If you don't have a clicker, you can use a positive phrase such as "yes" or a thumbs-up sign instead. Say "yes" or give Fido a thumbs-up and a treat. Like the clicker, the phrase or visual cue will mark the behavior you want. Get your dog to sit using a treat to lure him into position. Hold the treat with your thumb and forefinger and place it about an inch away from Fido's nose. Move the treat slowly over his head toward his ears, until his nose is facing upward and his bottom hits the floor. At the moment he sits, click or say "yes" to mark the behavior. While he's still sitting, give him the treat. Repeat this a few times until he sits each time you place the treat above his head. 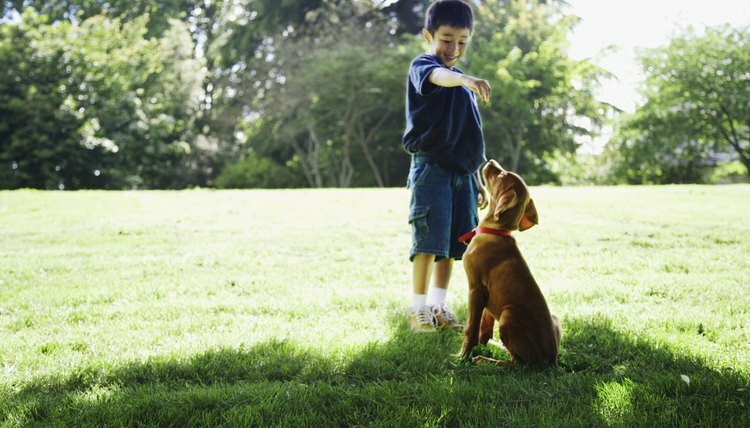 Associate the command with the behavior by saying "sit" and then luring your pup into a sitting position. Click and reward him when his bottom hits the floor. Once your dog regularly sits when you give him the verbal command to "sit," gradually lengthen the time necessary before you click and treat him. This ensures that he will sit for more than a few seconds at a time. Say the command, wait for him to sit, allow him to sit for 10 seconds, click and treat him. Eventually, you can lengthen the time, treating your dog a few times while he holds a sit. You also can associate a visual command with the sitting behavior. Hold your hand out, palm up and slowly lower it. Say "sit" and click and treat him when he obeys. Continue training him, eventually removing the verbal command. Once he obeys the visual cue alone, click and treat him. If dealing with a hearing-impaired dog, use the visual cue, lure him into a sit and thumbs-up and treat him. Keep training sessions to no more than 15 minutes, recommends the American Society for the Prevention of Cruelty to Animals. Don't verbally scold your dog or physically punish him if he doesn't do what you want. Dogs respond poorly to negative training methods. You'll only end up causing him to fear you. Train Fido up to three times a day, according to the Deaf Dog Education Action Fund. Always stay upbeat during training. End training sessions on a good note, with your dog successfully performing a sit, even a brief one. Gradually move your training sessions from locations with few distractions to busy ones so your pup sits calmly in any type of situation. Dumb Friends League: Teaching Your Dog to “Sit"